Hazy, Hot and Humid Tuesday; Tornado Watch in Vt.
Today (Tuesday): Hazy, hot and humid. Highs near 90 degrees. Overnight Tuesday Night: Showers and thunderstorms around. Lows near 70 degrees. Wednesday: Increasing sunshine with scattered showers. Highs in the low 80s. WEATHER ALERT: A Tornado Watch has been issued for parts of Vermont in New England. This watch has been issued because conditions favor the development of dangerous thunderstorms capable of producing tornadoes. Of course, severe thunderstorms without tornadoes may still impact your community with damaging wind and large hail. Our Early Warning Weather Team will continue providing live radar coverage of storms on-air and online – if your neighborhood is in a Tornado Watch, remain weather aware by keeping up with the forecast and the latest radar, and be prepared to immediately seek shelter in the lowest level of a sturdy building if a tornado warning is issued. Those warnings will be issued if a tornado is confirmed or imminent. As always, your necn Early Warning Weather Team will continue to provide radar analysis, street-level forecasts, critical information to save life and property, and suggested actions through our continuing coverage. 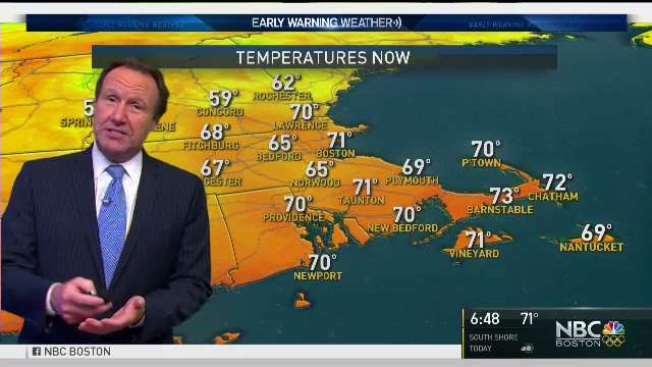 In addition to our live coverage, you can stay up-to-date with the latest weather information via necn.com’s weather page, and our necn mobile app. A hazy, hot and humid day is on tap today as southwest flow builds across the region. Heat indices reach into the mid-90s away from the coast. Thunderstorms are also expected to develop on northern and western New England around 3 p.m. If the storms ever make it to the coast, it will be around midnight. Wind damage is expected to be high in western and northern New England. There is also the expectation of flooding and an isolated tornado. Today may be the first 90-degree day for the month of August. The last 90-degree day this summer in Boston occurred on July 21. Overnight, an approaching cold front from the Great Lakes will trigger showers and thunderstorms after midnight. Expecting lows to only dip down into the low 70s. Shower and thunderstorm threat continues into Wednesday as cold front traverses across New England. A strong low-level river of wind will help to enhance thunderstorms during the first half of tomorrow. Any storms will contain heavy rainfall and dangerous lightning. As the cold front slides offshore, drier air will stream in across the region, bringing much anticipated relief from the heat and humidity. Highs max out in the mid-80s south and mid-70s north. Thursday kicks off a long stretch of dry and pleasant weather for New England as high pressure out of central Canada works in. This rolling dome of sinking air will result in mostly sunny skies for the remainder of the week into the weekend. A fall preview is in the cards for weekend as even drier and cooler air streams into New England from Canada. Expecting clear skies and highs only getting into the mid-70s south and the upper 70s north. More details are on the exclusive Early Warning Weather 10-Day Forecast on NBC Boston and necn.